The Norwegian Pearl The Haven area - Looking for photos of the Haven Courtyard Hot Tub area on the NCL Pearl? Here are a few for you. Again reserved only for Haven Guests. This Hot Tub is nice and quiet and for the most part wasn't that busy. 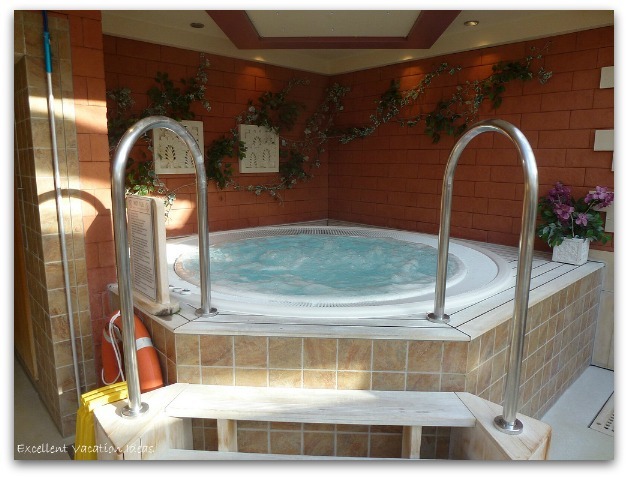 Enjoy a nice hot soak after a long day of touring during a port of call on your cruise. We found that it wasn't too busy, except on cool weather days or just before sail away after being in a port of call. It can be a little hard to get in and out of, especially on rougher sea days. There are towels available next the the washroom area. Have you visited the NCL Pearl Haven Courtyard? Or any other Haven Courtyard? Did you enjoy using the hot tub?